Ramnode Review 2019: Is Ramnode a Good Hosting? RamNode is a reliable shared hosting provider offering unlimited domains, bandwidth, SSL certificates and a 99.9% uptime guarantee. While they don't have a lot of advanced features, their hosting is more than adequate for the majority of personal and small business websites. 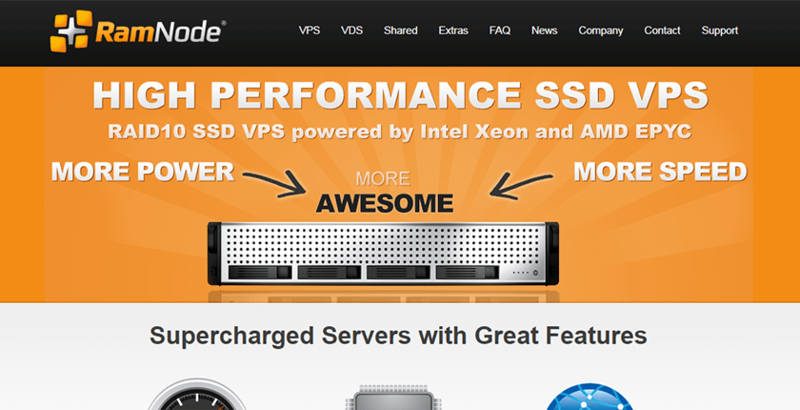 RamNode is a U.S.-based hosting company that’s been in business since 2012. They offer share storage solutions providing unlimited domains, ample storage, and a 99.9% uptime guarantee. It is a solid choice for most personal and small business websites. This site is appropriate for most personal sites and most small business sites. The platform is straightforward but appears to lack the features that power users look for. While RamNode doesn’t offer a drag and drop builder, they do provide the Softaculous auto-installer which will install WordPress and over 300 different scripts including CRM software, E-commerce software, and more. The site uses the latest cPanel technology, allowing power users to set up their websites quickly. RamNode only offers two forms of shared hosting, Shared, and Reseller. With shared hosting you get unlimited storage and bandwidth with 15 GB of storage. With Reseller, you can set up sub-accounts to sell hosting to others. You get the same features as Shared with 100GB of storage. Shared hosting should be more than adequate provided you don’t host multiple sites requiring massive storage requirements. You don’t have to sell hosting to take advantage of the Reseller hosting. It is not much more expensive, and you get 100GB of storage. Note that RamNode does not offer free domains for their plans, nor do they offer domain registration services. You must sign up for your domain name separately and transfer it to RamNode. RamNode’s support is decent but has room for improvement. Their knowledge base is impressive and has answers for over 400 topics. Otherwise, your only option for contacting technical support is through an online ticket. RamNode offers an unusual form of support, an IRC community support forum. That’s right, a web-based, old school IRC chat channel. The channel is quite popular, and the members are helpful. However, they are not members of RamNode’s support staff. Hosting services should, at a minimum, offer online chat support for their customers, so the lack of live chat and phone support is disappointing. If you’re looking for a hosting provider offering unlimited domains, unlimited bandwidth, and a near-perfect uptime guarantee, then RamNode should be on your shortlist. While their customer service could be better, they offer the affordable basic website hosting that most personal and small businesses need. Wondering how Ramnode stacks up against other Web Hosting companies? Enter any other Web Hosting company and we will give you a side-by-side comparison.